It’s tempting to pay off all those credit card debts with a new loan, then make just one monthly payment. Tempting, but risky. Most consumers who use bill consolidation or take out debt consolidation loans end up throwing good money after bad. They usually build an even more towering mountain of debt in just a few years because they didn’t change their spending habits. What is Bill Consolidation, Anyway? There are many types of bill consolidation, from student loan consolidation, to credit balance transfers, to home equity loans and other forms of secured debt consolidation. In all cases, the consolidation just covers up a problem. It doesn’t give consumers the resources they need so that they don’t have to rely on credit and can begin to build a healthy financial future. It also isn’t always cost effective. For example, when consumers get on a longer repayment schedule, they end up paying more over time, even if the interest is lowered some too. And, some forms of consolidation are extremely risky. For instance, if you can’t make your payments on a home equity loan, you may lose your house. And, if you don’t pay off your new credit account quickly, you might be dealing with an astronomical interest rate and a damaged credit score after using a balance transfer. Our credit counselors at Clearpoint work hard, not just to get you lower interest rates with creditors but, most importantly, to educate consumers on taking control of their finances, helping them change old habits and conquer debt once and for all. Is Debt Management For You? are dodging collection calls for overdue bills. are financially overwhelmed by several credit card balances, some at high interest rates. are only making minimum monthly payments or less. feel overwhelmed by debt and aren’t saving any money. are “maxed out” on credit lines. sometimes skip or “juggle” bill payments. A certified consumer credit counseling expert can review your personal financial situation through an obligation-free budget counseling session. At the end of this consultation, your Clearpoint credit counselor will review all of your options with you, including the option of a customized Debt Management Plan to help you pay off credit card balances in full. If you are a good candidate, he or she will recommend a debt management program to repay your credit balances. You may be surprised to see how quickly consolidating those bills into the same (or lower) monthly payment can knock out your debt. In a debt management program, you pay the credit counseling services agency an agreed-upon monthly amount, and they disburse those funds to your creditors. As a nonprofit organization, Clearpoint offers debt management services for a modest fee that is included in your monthly amount. Your credit counselor will submit requests to your creditors on your behalf to help reduce minimum payments or interest fees. You will receive monthly statements from Clearpoint reflecting the debt you have been able to consolidate through the program. The statements show how much debt you have on the program and how much you pay monthly, so you will know how soon the bills will be paid in full. There are agencies with varying areas of expertise out there, so it is important to find the one that is right for your situation. Make sure that the credit counselor answers your questions and provides relevant and meaningful information–you should completely understand costs involved and how the process will work. Your first month’s payment should never be put toward agency fees only, and a reliable agency will always gladly provide an address, contact information, and the counselor’s name. If you think a Debt Management Plan might be right for you, there is no reason to delay. Next month’s convenient, consolidated bill payment could be putting you on the road to a debt-free future. Call 800.750.2227 (CCCS) to make an appointment for a free credit counseling session or get started now online. Start paying down your debt today! 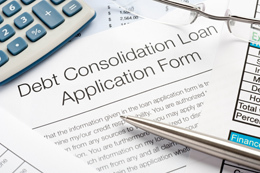 Discover the convenience and simplicity of consolidating with a debt management plan.